This is the only conclusion I am able to come to after last night's sleepless extravaganza. It was the "puttin' on the ritz" musical dance number of sleeplessness. It was like the "Mandie" dance scene in White Christmas. Or like the "Gotta Dance" number in Singin' in the Rain. I may as well have worn a long sequined gown with white elbow-length gloves to bed. Rose woke up about twice an hour, all night long, culminating in a tantrum at 5am. The main source of the conflict was her wanting to nurse back to sleep and me drawing the line in the sand because I was completely fed up. 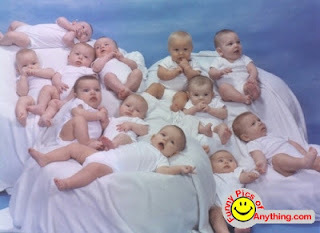 I want to have more babies. 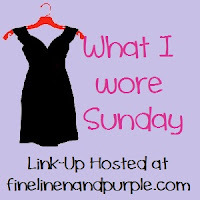 Time for What I Wore Sunday again, hosted by Fine Linen and Purple! I am really starting to enjoy this link up, I must say. I just wish I could get my posts up earlier in the day. The sweater is NY and Co., layered with a white tank for modesty, and the skirt is from a little fashion boutique in San Diego...a boutique run by a self-proclaimed witch. Although the witch tried to convince me that no slip was necessary underneath this very sheer skirt, I really must insist upon one. That is why I can only wear it during cooler months. The extra layer is suffocating in the summertime, which is sad since its very summery-looking. This scarf was my grandmother's and I thought it paired well with the skirt in terms of color and fabric. However, I am not an accessory person, and I wasn't sure quite how to wear it. So I just slung it around my neck. Anyone have a good suggestion on how to style thing thing?? I am participating again this week in What I Wore Sunday, but only with Ivy this time...because I like what she wore, and we were running a little late so I only had a chance to photograph one other family member before we had to run out the door. This gray halter top dress is Evan-Picone, and though you cannot see it in the picture, the fabric has a slight sparkle to it. Because I am not about go to church bare-shouldered, and because its freezing cold, I am also wearing a cardigan from JC Pennies. I think the brand is George and Martha, or some such thing. The shoes, like most in my closet, are ancient. I have had these since I first moved to Vegas in 2004 and they are Nine West. Since we have three girls who have birthdays one month right after the other, we decided to have one party for the three of them. The theme they chose was Pink Pirates. They are totally into pirates. Not necessarily just pink ones, either. As you know, I love party planning, and while I could have just bought a zillion paper plates and tablecloths with pink backgrounds and skulls all over them, I felt that was not much of a challenge. So instead I decided to make if more of a "Pirate Adventure on the High Seas." 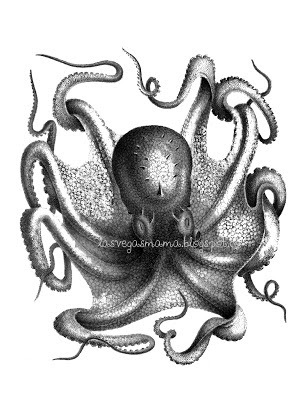 I had seen this drawing of an octopus and I knew that was the feel that I wanted to convey in the party. It's a little bit old-fashioned and wonderfully evocative of the mysteries of the ocean, don't you think? Makes me think of giant sea monsters lurking in the deep. So this was my inspiration. And I wanted to try and do this with minimum amount of skulls and crossbones...because really, it's just too easy.